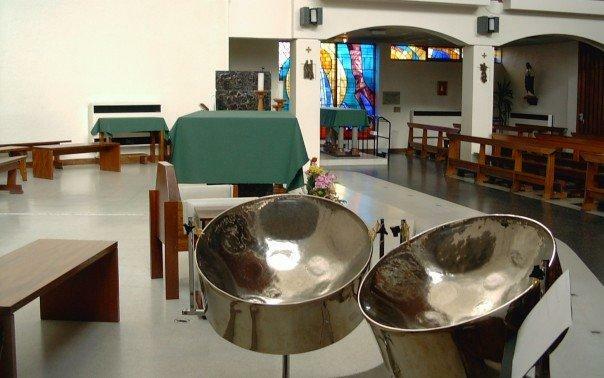 Funeral Day Steelband by Gary Trotman Steelasophical. “The very first funeral service I ever played at was for my very own mother – the second service was for her her sister my aunty. This places me in very unique position of truly understanding the balance between grieving and celebration of life by means of music! As an experienced musician, Gary travels throughout the UK in order to play at Funerals and other events. By its very nature, a funeral is a very emotive event, and the most appropriate time for family and loved ones to say a final farewell to the deceased person. 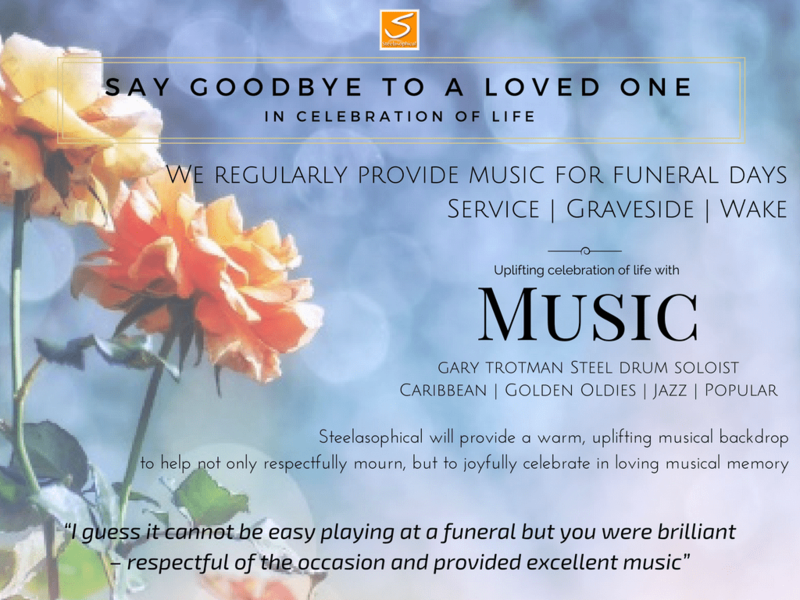 No two funerals are the same, and sometimes he receives requests for tunes that are not usually associated with funerals or the loss of a loved one, but none the less are important to the family. Should you appoint him, he will then work with the undertaker and/or the family advising on appropriate protocols and actions, and where appropriate advising on music choice. When you suffer a bereavement, a funeral for a member of your family can be one of the most emotional times of your life. Everything your family and friends thought about a loved one is expressed on that day. Texting and making or receiving phone calls during a service is a big no-no. It is very disruptive to those around you, and gives the impression that you are not especially interested in the events going on. Such behaviour can easily be construed as hurtful to those who are grieving, even if that is not your intention. So just to ere on the side of caution, it is best to power off your phone and keep it tucked away. Offering words of kindness is perhaps the best thing that one can do when attending a funeral. However, though sharing condolences face-to-face is more personal, if you are unable to attend a funeral service, sending a message of sympathy can be a thoughtful alternative. Sending flowers is generally seen as a more heartfelt way to show you care than simply sending a card. Furthermore, though offering money is often understood as impersonal, it is thoughtful to send a charitable donation to a foundation in honor of the deceased. At the end of the day, you are there to pay your respects to the deceased and their family. Simply being there and observing the ceremony is appreciated- don’t sweat the small stuff. It is very common to hold a reception for friends and family after the funeral or cremation. How many people are you going to invite, as this will dictate the size of the venue required. Will you you require catering and a bar. If relatives have travelled a long distance will they require accommodation. If you are having a reception after the funeral ask either the funeral director or a family member of friend to make an announcement to let people know when and where it is either at the funeral home or at the end of the memorial service. However if you only want a family only reception just tell the appropriate guests and make sure that they are aware that it is a closed event. The reception is a final send off for a loved one, and you do what you feel is right for you and your family. there are no wrongs or rights as what you can or can’t do just what feels right and respectful. You can also have a open speaking platform where friends and family can say a few words about the deceased and share memories of them with everyone. 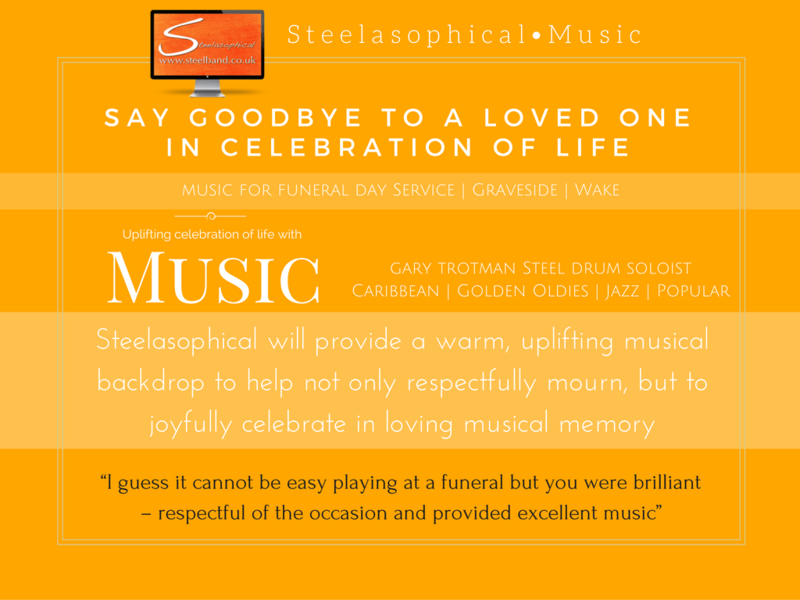 Funeral Day Steel Band Hire 07540 307890 from steelasophical on Vimeo.